Alongside Mountain Lion 10.8, Apple released the server component as a separate generic app called OS X Server. OS X Server is the next generation of Apple’s award winning server software. Designed for OS X and iOS devices, OS X Server makes it easy to share files, schedule meetings, synchronize contacts, host your own website, publish wikis, configure Macs, iPhones and iPads, remotely access your network, and more. Server is now an application you can add to Mountain Lion right from the Mac App Store. 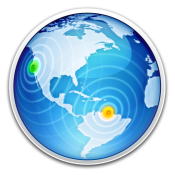 Anyone can quickly and easily turn a Mac running Mountain Lion into a server that’s perfect for home offices, businesses, schools, and hobbyists alike. Well that sux to us people who own the server edition of the Mac mini and now we have to pay twice as much to keep it a server! You don't have to pay anything to keep it as a server. You have to pay to upgrade it to a new version of OS X server. That's one good-looking icon. Damn. Are those supposed to be earthquakes? We're looking at some terrible destruction here, folks. What if i bought Lion Server like 2 weeks ago? You think I might be able to get a redeem code, like with a new mac purchase? Not feeling a lot of sympathy for you considering we all knew 10.8 was coming out this month and there were a lot of signs pointing to today as a release date for weeks. From what I understand my 2008 8-core 3 Ghz Xserve with 10GB of memory is inadequate to run Mountain Lion, and therefore can't run Mountain Lion Server. I would say this xserve has more computing power than 99% of all macs. Is this really all because it does not have the right graphics card? Now I can't upgrade Lion server to mountain lion to fix the crap thats broken like File Permissions, Address Book and Network Spotlight etc.. Crazy! Let me know if anyone gets Mountain Lion on an Early 2008 Xserve working. I'm in the same boat... no ML server for me because our Xserve's don't have GFX cards... never mind the fact that half the crap on Lion doesn't work and we were waiting for the upgrade... it's throw the Xserve in the bin. Mac OS X Server use to be $499 or something. Now it's $39.98 ($19.99 + $19.99). Hardly "twice as much". The price isn't the issue. The fact that 75% of the Server OS had been destroyed since 10.6 is the issue. Apple's wonderful OS X Server "upgrades and enhancements" made it an easy decision for us to start swapping our Xserves with Dell PowerEdge servers loaded with Linux or Windows. The DHCP service is no longer managed as a separate service in OS X Server. DHCP is used by the NetInstall service to provide startup information to NetInstall and NetBoot clients. It can also used by Internet Sharing (in the Sharing pane of System Preferences) to provide addresses to clients sharing the server's internet connection. Only one of these two services can be used at one time. If you enabled NAT and DHCP in Server Admin in Lion Server, your configuration will not be preserved when you upgrade to OS X Server (Mountain Lion). You can restore the default NAT and DHCP configuration by disabling then enabling Internet Sharing in System Preferences. If you enabled DHCP (only) in Lion Server, or you enabled DHCP in Mac OS X Server v10.6, your configuration will be preserved and remain active when you upgrade to OS X Server (Mountain Lion). The Firewall service is no longer managed by OS X Server. Existing Firewall rules remain active after upgrade, but any further firewall configuration must be performed on the command line. For more information, see this article. DHCP and NAT are handled via System Preferences. ipfw is deprecated but still retains your Lion rules and can be managed by command line or 3rd party front end. Has anyone tried putting 'ML Server' on a 2008 XServe, even by cloning an existing installation rather then straight installing? Considering all that has been lost in OS X Server, why would you want to do that? Lol, no DHCP server? Really? What is even the point to this, then? DHCP is still there but the GUI isn't.